“Spoogy” transitioned from labor to reward on Thursday, March 22, 2018 at The Quarters at Des Peres Rehabilitation Center in Des Peres, Missouri. He was born in Wayne County, North Carolina on January 17, 1938 to the late Mr. Jesse Martin, Sr. and Mrs. Ida Jackson-Martin. He was educated in the Wayne County public school system and attended Central High School in Goldsboro, North Carolina. He graduated from Oakwood College Academy of Huntsville, Alabama in 1957. 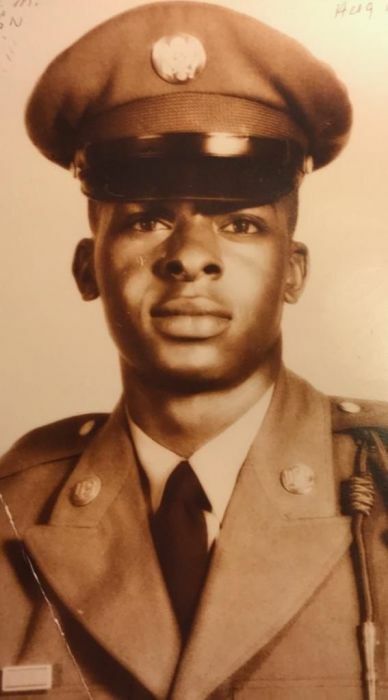 After graduating from high school, “Spoogy” served his country by enlisting into the United States Army and he was honorably separated from service on August 11, 1959. During “Spoogy’s” working years, he served as a Professional Truck Driver. Mr. Martin was preceded in death by his parents, Mr. Jesse Martin, Sr. and Mrs. Ida Jackson-Martin; his daughter, DeVera A. Martin; his three brothers, Carl Edwards Martin, Jesse Martin, Jr. and Harlon James Martin; his five sisters, Ethel Leonora Johnson, Georgia Mack, Virginia Bridges, Tessie Whitfield and Doris Edwards. A celebration of life service will be conducted on Sunday, April 8, 2018, at 12:00 p.m. in the Mount Zion Seventh-Day Adventist Church, 1289 Parkstown Road, La Grange, North Carolina. Pastor Albert L. Dyson will officiate. On Monday, April 9, 2018, at 9:30 a.m., Interment will be held in the Eastern Carolina State Veterans Cemetery, 164 Longs Plant Farm Road, Goldsboro, North Carolina, 27534. Also, one hour prior to the celebration of life service, a public viewing will be held on Sunday, April 8, 2018 from 11:00 a.m. to 11:50 a.m. in the Mount Zion Seventh-Day Adventist Church, 1289 Parkstown Road La Grange, North Carolina. Mr. “Spoogy” leaves to cherish his loving and precious memories to his children, Wallace M. Martin, Jr. of Fort Pierce, FL; Maurice L. Martin of Temple, TX; Alichia G. Martin, and Michelle D. Manley both of Ocala, Fl; his grandchildren, Amelia S. Martin of Lawrenceville, GA and Alton Manley of Ocala, Fl; his brother, Ernest McKinley Martin and wife, Francine of Baltimore, MD; a special niece, Phyllis Dawson of La Grange, NC; a host of nieces, nephews, cousins, other relatives and friends. On Sunday, April 8, 2018, the family members and friends will assemble at Britt Funeral Home, 414 East Washington Street, La Grange, North Carolina at 10:00 a.m. in preparation for the funeral procession. Flowers may be sent to Britt Funeral Home and Cremation Service, 414 East Washington Street, La Grange, North Carolina, beginning on Friday, April 6, 2018 from 10:00 a.m. to 4:00 p.m. Arrangements by: Britt Funeral Home and Cremation Service, La Grange, North Carolina.